Future Planet Capital are delighted to announce Origami Energy as winners of the 2018 Future Planet Awards, hosted in association with Global Corporate Venturing. When Genome Research Limited agreed to license the Wellcome Trust Sanger Institute technology and back the spin-out of Congenica in 2014, the Wellcome Trust was laying the foundations for a new cohort of biodata driven companies to grow and flourish on the Wellcome Trust Genome Campus in Cambridge, UK. Today, Congenica is a trailblazing success story that Sanger seniors are keen to replicate. Congenica’s new CEO, Dr David Atkins and Chief Scientific Officer, Nick Lench. Dr. David Atkins, Congenica’s new CEO, and Dr. Nick Lench, Founder and Chief Scientific Officer, sat down with The Future Planet Blog to share their insights following both firm’s success in securing MOU’s during Secretary of State for International Trade, Liam Fox’s recent delegation to China and discuss Congenica’s current plans for global commercial expansion. In the winter of 2013, a new start-up entered into a partnership with Genomics England for the UK 100,000 Genomes Project – an initiative to sequence the genomes of 100,000 UK National Health Service (NHS) patients with rare disease or cancer. The genome annotation assessment challenge was known as the “Genome Bake Off,” in a nod to the much-loved British television show where amateur chefs vie to make the tastiest dessert treats. The team gathered their seed funding and set up base camp in a portacabin on the Wellcome Trust Genome Campus, in Hinxton, Cambridgeshire, only big enough for a handful of people. Their Bake-Off victory, announced in October 2014, helped to precipitate the launch of Congenica as an independent commercial entity. In November of that year, Congenica – now firmly focused on developing tools to support clinicians in diagnosing rare diseases, a platform called SapientiaTM – picked up its first VC investment from Cambridge Innovation Capital, rapidly followed by another from Amadeus Capital Partners. The Wellcome Trust Sanger Institute is a genomics research centre of global repute. It bears the name of Frederick Sanger, the British double Nobel Prize winning scientist who developed the initial paradigm shifting method of DNA sequencing that was used in the original Human Genome Project in the 90s. It’s now been four years since the UK 100K Genomes Project Bake Off, and a year since the firm’s Series B financing round, when Future Planet Capital took a stake alongside Parkwalk Advisors, Beijing Genomics Institute and Healthlink Capital, while original investors CIC and Amadeus injected further sums. Over the past three years, the company has continued to improve and refine their gold-standard clinical decision software for interpreting genomic data, SapientiaTM. Now, they are concentrating on commercialising through a series of specialised partnerships. Congenica is already an interpretation partner in a number of large scale projects around the world, including in the UK, China and Portugal. The company’s UK National Health Service partnership has also helped them to forge their credibility and prove their integrity, as well as refine its software for clinical use. 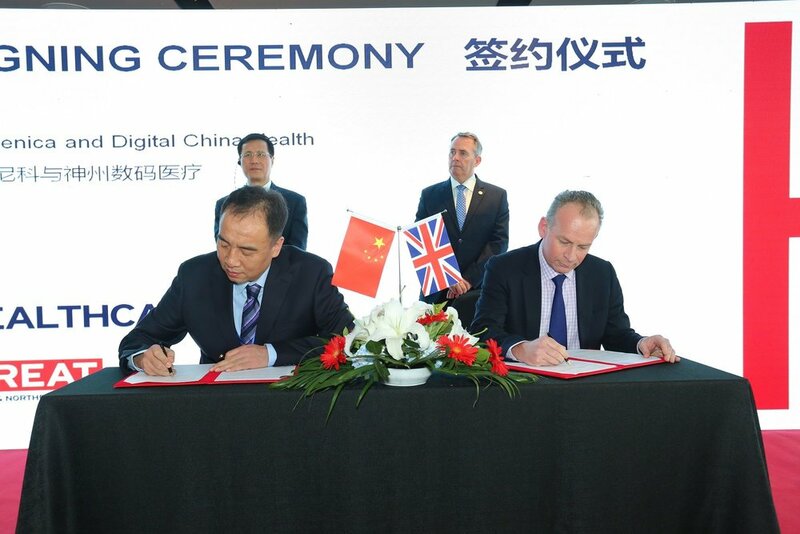 “Our second set of partners are health delivery networks, including insurers,” Atkins adds, “thanks to our relationship with the Beijing Genomics Institute, we just signed a partnership with Digital Health China,” he says. During the Prime Ministers recent visit to China, Congenica and Future Planet Capital were among the British companies signing £9bn worth of deals with Chinese companies and investors. Congenica also has strategic partnerships in the US, including with the New York Genome Center. With the time-frame involved, the willingness of Congenica’s investors to take a long-term view has been of critical importance. “CIC and Amadeus are very aligned, very mature and have deep insight on this technology,” says Atkins. “They know that a credible foundation is extremely important, and at Congenica we are continuing to prove that.” Future Planet Capital are firmly committed to a patient, long-horizon strategy. “Recent years have seen accelerated and fundamental changes to the ecosystem of university research, commercialization and investment,” says Professor Jerome Engel. In a new article for The Future Planet Blog, below, he explores three of the most intriguing new trends: the rise of ‘university venture funds,’ the changing nature of corporate VC, and a big push from the government funders of university research." Few people are more familiar with the intricate and complex realities of “double bottom-line” investing than Elias Masilela. In his almost-four-year tenure as CEO of the US$140 billion South African Public Investment Corporation (PIC), the asset manager for Africa’s largest pension fund (GEPF), he not only grappled with the integration of investment goals and socioeconomic influence: he championed it on the global stage. This week, we discuss our submission to the Government's recent consultation 'Financing Growth in Innovative Firms'. Published last month as part of the 'Patient Capital Review', the consultation sets out research and proposals for how Britain can provide the long-term capital required to scale and grow innovative companies. The results of the review are set to inform part of Phillips Hammond's Autumn Budget on 22 November. On the back of a $4.5 million Seed financing round in 2015, SAM Labs – dubbed “the Lego of the internet generation” – has ramped up its mission to take its child-friendly electronic engineering toys from the playroom to the classroom. The three-year-old start-up is now winning recognition for its educational impact, including a 2017 Future Planet Award. FPB recently caught up with CEO Joachim Horn. Today, the winner of the 2017 Future Planet Award for Healthcare is diversifying beyond its undoubtedly successful roots – keeping life-saving vaccines cold “off the grid” in some of the world’s poorest countries – and looking to take on the $90 billion* global refrigeration industry. This means new partnerships, new prototypes and, importantly, new potential investors. FPB went to find out more. Bluepha, winner of the Future Planet Award for SUSTAINABLE GROWTH, is pioneering a revolutionary cost-effective method for producing bioplastics. This week, FPB speaks with CEO Terance Teng LI about his firm’s latest technical advances and commercial progress as they transition from the lab to the factory floor. “Peter Thiel [the PayPal co-founder] studied Philosophy at Stanford. Ben Silbermann [co-founder and CEO of Pinterest] read Political Science. Brian Chesky [co-founder and CEO of Airbnb] studied Industrial Design. But now entrepreneurs with non-scientific backgrounds can’t even get meetings with most venture capital firms,” says Patrick Chung, General Partner and Co-Founder of Xfund. On May 23rd a panel of judges, chaired by Lord Norman Foster, will quiz five fascinating start-ups, all winners of the 2017 Future Planet Awards, debating their merits in front of a live audience of investors and venture funds. The ultimate victor will carry away the ceremony’s top prize. Since launching in 2016, Flock has raised half a million pounds from a combination of VC, angel and corporate investors. Pioneering a smarter drone insurance model based on Big Data analytics for quantifying drone flight risk in real time, the start-up has garnered interest from insurers, drone users and tech experts alike…and the first product hasn’t even been launched yet. In this week’s Future Planet Blog, CEO Ed Klinger tells us how they got started and explains why his investors have been “transformative” for the business. "Tsinghua University has been the number one-ranked university in China for years. Yet most people outside of Asia haven't even heard of it," says Dan Cowen, Director of International Affairs for Tsinghua Holdings Capital. This week we speak with Lord Wei, one the judges of the upcoming Future Planet Awards. Launched this year in partnership with Global Corporate Venturing and Tsinghua Holdings Capital, these awards will celebrate the most exciting and innovative new businesses with the potential to address global challenges. Last week, The Rise of British University Venture Funds - Part One explored the emergence of a new generation of UK institutions focused on innovation investing. When it comes to funding for university spin-outs, the country has progressed from being one of the world's laggards to one of its front-runners in just two years. It is now home to the world's largest university venture investor, Oxford Sciences Innovation (OSI), and an expanding roster of similar entities. In Part Two, we take a closer look at OSI and its Cambridge counterpart, Cambridge Innovation Capital (CIC). Founded in 2015 and 2013 respectively, these two entities are now setting the tone for investment in the country's university clusters. They are also attracting the attention of sophisticated investors worldwide. With an evergreen structure enabling a more long-term horizon than conventional venture capital funds, their recent fundraising rounds have brought leading sovereign wealth funds and investment managers knocking alongside the more familiar UK university investors. British venture: immature or ahead of the curve? The road from laboratory to industry is a time consuming and long one, but the rise of a raft of new University Venture Funds (UVFs) in Britain is helping to transform the innovation landscape. The country is now home to an increasing number of firms committed to turning innovative ideas from academic organisations and associated clusters into world class companies.